A brand new photo from John Wick 3: Parabellum has made its way online. Production is currently underway on the finale to the John Wick trilogy, which will once again see Keanu Reeves racking up a high body count in (hopefully) glorious fashion. A new official photo from John Wick: Chapter 3 has been released which doesn't actually feature the titular assassin. However, it does include a couple of his close known associates who are going to be coming face to face in the upcoming installment, as it turns out. The photo features Ian McShane's Winston, who has been a part of the series from the very beginning, standing alongside Laurence Fishburne's Bowery King on a rooftop. 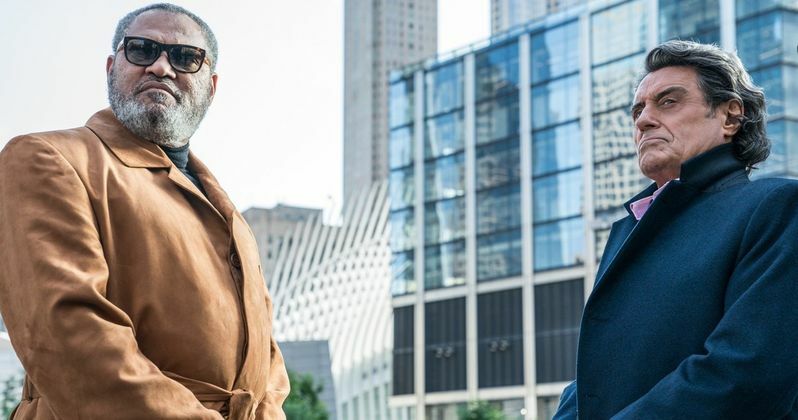 Fishburne's character was introduced to us in John Wick: Chapter 2 and played a crucial part in the assassin's last adventure. He and Winston never actually met during the events of the sequel, but it looks like they're going to directly cross paths this time around. For what reason and to what end? We're going to have to wait for answers on that front. Though, we're guessing it has something to do with the fact that Wick has been excommunicated from The Continental and the assassin's order and is now facing death with a huge price on his head. John Wick: Chapter 3, which is officially titled John Wick 3: Parabellum, as was recently revealed by Keanu Reeves, is set to conclude the character's journey. However, that doesn't mean the franchise is done just yet. Lionsgate is currently developing a series titled The Continental that will explore the mysterious and intriguing assassin hotel from the movies. The studio is also in development on a female-led spin-off titled Ballerina, which we first got wind of last summer. Chad Stahelski, who co-directed the first movie with David Leitch and flew solo on Chapter 2, returns to the director's chair for the third installment. The cast also includes Lance Reddick, Ruby Rose, Common, Anjelica Huston, Asia Kate Dillon, Mark Dacascos, Jason Mantzoukas, Tiger Hu Chen, Yayan Ruhian, Cecep Arif Rahman, Jason Mantzoukas and Halle Berry. The movie will pick up in the wake of the second movie's conclusion, with Winston giving Wick a one hour head start before putting a $14 million contract on his head. John Wick: Chapter 2 saw a big bump at the box office compared to its predecessor, largely due to the very positive word of mouth that the first movie received. It's likely we could see that trend continue with this upcoming installment, which is set to arrive in theaters on May 17, 2019. That date positions it as a potential early summer hit. It's a strategy that runs counter to what Lionsgate did with the previous two movies, which were released in October and February respectively. Be sure to check out the new photo, courtesy of the John Wick Chapter 3 Twitter account, for yourself below.